Hear ye! Hear ye! Medieval times are not the greatest. Case in point, the opening scene of this week’s episode begins with a classic burning-at-the-stake, an activity that happened once or so too often in yon. A pompous priest named Father Benedicto coolly murders a couple in this fashion, lighting the fire himself, as the couple’s young son cries for mercy. One of only a few atrocities we catch glimpses of. 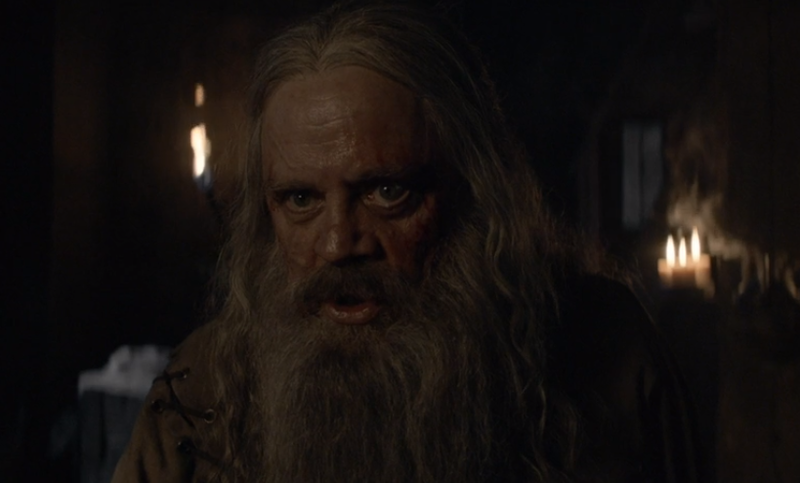 The corruption of the church is a large background force in the show’s narrative, even as more physical dangers threaten everyone and everything. Landry tries to take the blame for Rhone, earning his group a special punishment. Talos sends them out to chop down a tree, strip the bark off, and carry it back on their shoulders for upcoming strength training. A bro trip to the forest sounds kind of nice after what their usual regimen has been. But “nothing good happens in the woods after dark.” The group stumbles across a group of Luciferans (NOT the TV show fandom) carrying out some ye olde human sacrifice. There’s a clear parallel to the earlier flashback with the burning-at-the-stake, although this group kills their victims prior to burning them. Points for humanity? Not so fast. It turns out there are more of them in the woods. They attack Landry’s group, and Quentin sustains a number of vicious injuries. They fight for their lives and flee back to the temple. Landry begs them to save Quentin, but he’s already dead. It is SAD. He wants to go back out with the scouting party right away. Talos gives him a tongue lashing. 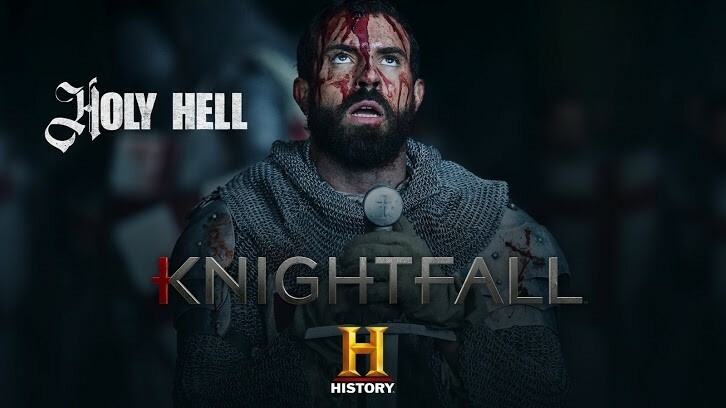 A beginner doesn’t ride with the knights, and it won’t change the fact that Quentin died on Landry’s watch. Could things get worse? Some of the other Templars, led by Berenger (Peter O'Meara) feel that Landry has brought the devil into their midst. They attack him, gag him, and brand him with a cross to cast out the evil. It’s basically the most polite way someone hurts someone else in this episode, and that’s saying something. Boyfriend material Tancrede (Simon Merrells) returns from running an errand and finds Landry in the aftermath of this humiliating ordeal. 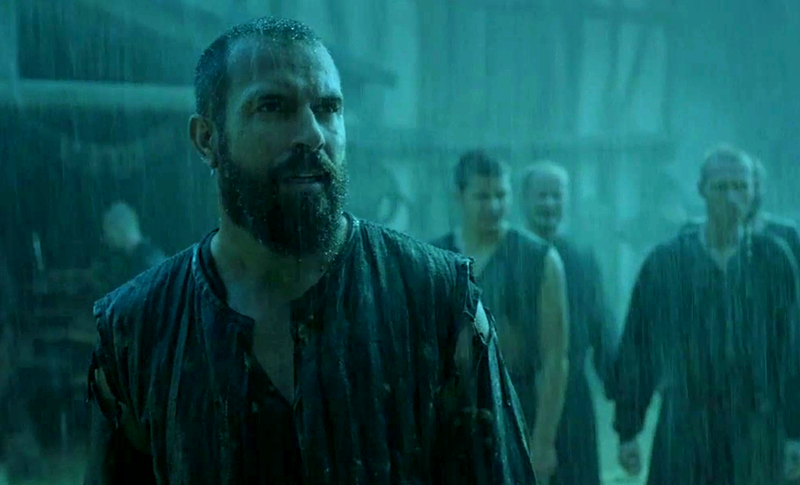 He won’t give up Berenger or the others, echoing Talos’s words about not betraying one’s brothers. Nonetheless, his spirits look crushed. The French royal family is not in group therapy yet, but they sure should be. 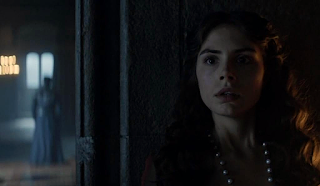 Isabella (Genevieve Gaunt) is roughly informed by her father that she has no choice but to marry England’s King Edward (Son of THE Edward involved in the drawing and quartering of William Wallace). Girl should know better to invoke than her dead mother’s objections, as King Philip (Ed Stoppard) clearly would rather do anything but discuss Joan. In fact, Louis catches his dad quite possibly about to take an ax to his mom’s corpse. To top all that off, Philip won’t listen to Louis’s reasoning that Joan deserves a queen’s funeral. It’s definitely too late for this family to go to group therapy. All that said, Louis appears to be unstable. At first I thought maybe he just had this roguish fiend thing going on (actor Tom Forbes can be quite charming) even with digging up his mom and all that. However, Louis and his Knights of Ren set off on a disturbing quest. They help themselves to recent baptismal records, kill a priest, and maybe (definitely) go off to slaughter some babies to prevent Joan’s baby from being a contender for the throne. It now seems that Louis is not so much interested in preserving his mom’s memory as he is in making sure her actions don’t get out and tarnish his own legacy. De Nogaret (Julian Ovenden) is juggling multiple frying pans. Philip and Louis want to hunt down Landry that very second and squash all Templars on the way. 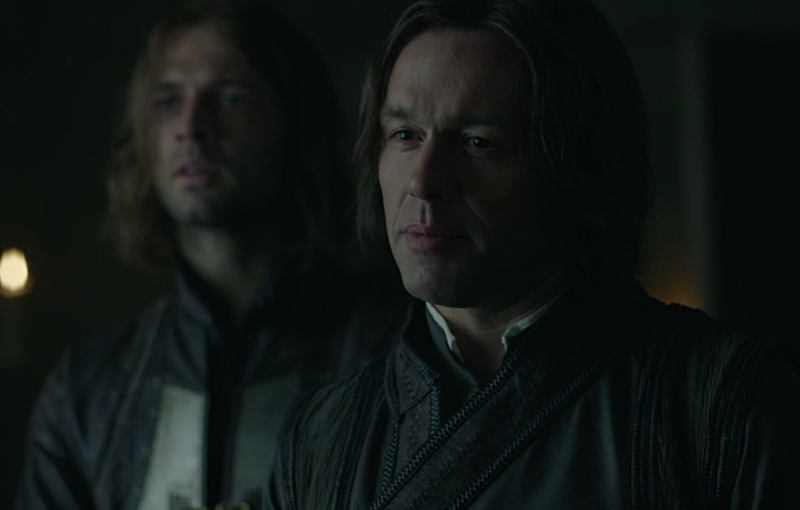 De Nogaret suggests they put together a legal case against the Templars. It’s the classic “we can’t get a guilty conviction in criminal court so we’re taking this to civil.” Philip and Louis are all “You do that, and we’ll wait” wink/wink/fingers crossed behind their backs. 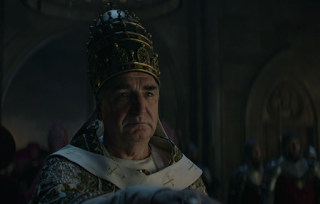 The arrival of Pope Boniface VIII (Jim Carter) complicates matters, since Boniface supports the Templars and carries plans to make a new decree that will give him control over church and state. “To put it simply, submit or be damned.” He beams and extends the holy hand to be kissed. Philip has De Nogaret make that gesture of subservience. It turns out that De Nogaret has an entirely different agenda. He has Gawain (Pádraic Delaney) kill the Pope’s guards (a stylish yet brutal action sequence). Although Gawain is a little conflicted when the Pope recognizes him and orders his protection, he ultimately does nothing to stop what happens next. De Nogaret reveals that Boniface started out as Father Benedicto and that DeNogaret is the boy whose parents were burned in the flashback. He says the incident forever destroyed any religious beliefs or loyalty he had. There was no mercy then, and there will be no mercy now. Before killing Boniface with his bare hands, DeNogaret shares that, in death, Boniface’s remains will be mingled with that of his “heretic” parents. 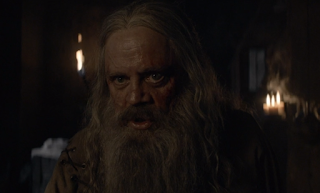 He draws a cross on the dead man’s forehead using some of his parents’ ashes which he carries with him in a bag. “Long live the Pope,” DeNogaret pronounces before leaving the body. A deliciously ice-cold performance from Ovenden. Don’t bother tracking the body count, because it just keeps growing. The episode reveals the location of Baby Eve. Tancrede visits the quiet convent to check in. He has a special bond with the nun watching over her. He also brings a Bible, as the nun is also an artist who illuminates manuscripts. This convent feels much less safe after you consider that a Pope and a priest have been killed in this episode. Is nothing sacred? That is not a rhetorical question. At the same time Tancrede returns and comforts Landry after the latter’s branding, the scouting party is ambushed by Prince Louis and his dark henchmen. He kills them all, making sure to shoot the last arrow himself. That is another heap of bodies for Landry to add to his conscience. “The Devil Inside” brought some serious darkness with it. It was gritty and relentless, and the performances are still fantastic. There were a couple points with Landry’s decision-making where it felt like he was trying too hard to be the martyr, but of course there’s no forgetting he has buckets of blood on his head. All in all, though, this show’s path isn’t easy to predict. Even with historical characters and timelines being loosely adhered to, there’s still multiple wild cards in play. And that keeps me on the edge of my seat. Nearly 1,000 year old spoiler alert: The real life Princess Isabella would end up marrying Edward Jr. Yes, by Braveheart canon, Isabella is the same princess/future queen consort Wallace has a fling with. And while she probably didn’t do that in real life, there were quite a few twists and turns in her biography. The real-life Pope Boniface’s demise was less personal but even more dramatic. In case Knightfall saves that story for its next Pope, I won’t go into it here.